NEW QUAY RNLI recently assisted Clwb Rhwyfo Llangrannog Rowing Club with their training for this year’s Celtic Challenge. The biennial challenge sees teams of 12 people rowing through the night from Arklow in Ireland to Aberystwyth in Wales, a journey of approximately 97 miles. The race is an extreme test of endurance and usually takes between 15 and 24 hours, depending on the weather. Two New Quay RNLI crew members, Laura Mears and Heather Rees-Gaunt, are members of the Llangrannog Rowing Club and Heather will be taking part in the gruelling challenge which is set to take place between May 3-6, 2019. 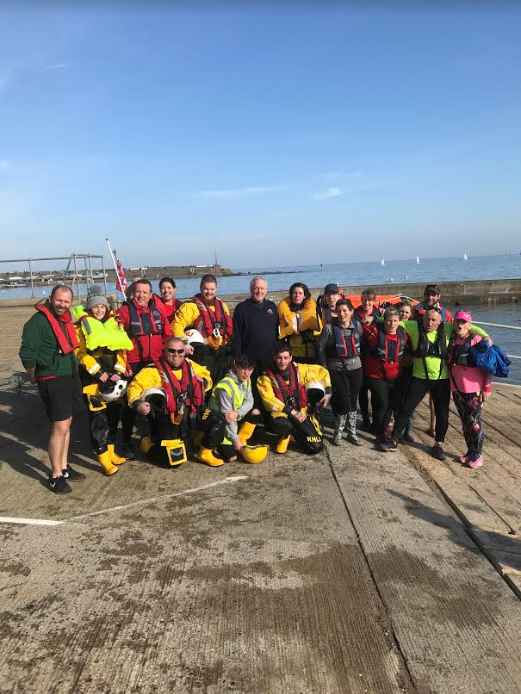 As part of their preparations, the rowing team took part in a structured exercise with lifeboat crew members simulating a person overboard incident so that the rowers gained experience in manoeuvring the boat and recovering a person from the water. New Quay RNLI Community Safety Adviser, Roy Fenner, also gave advice on safety equipment and means of calling for help. Heather, who has previously rowed the Indian Ocean from Australia to the Seychelles, breaking two world records, said, “These training exercises with the RNLI are crucial for our preparations as we will be rowing in the Irish Sea at night, which can be a dangerous place to be if you’re not fully prepared. The person overboard training helps each team member know what to do if the situation arises. BBC cameras are following their journey, including preparations and training as well as the race itself, with each team member raising money for a charity of their choice. The club is still searching for sponsors for various items of clothing for the challenge. If you are able to help please email Rhwyfo Crannog Rowing on mispinc@hotmail.com or call 07415 351 431.